Unless your Florida home is owned free and clear of any financing you are required to have home owner’s insurance that either at least covers the amount of the loan that is secured by the property or the replacement cost of rebuilding the home. This is frustrating for some who are skeptical about insurance in general especially as the costs of insuring Florida properties has become extremely expensive and even more so for those in coastal areas like Fort Lauderdale, Miami, Key West, Sarasota and Ft. Myers. However when a hurricane strikes you will certainly be glad that you had insurance. Though there are a few things that you should watch out for. Deductibles are often required to be at least 2% on many Florida homeowner insurance policies. 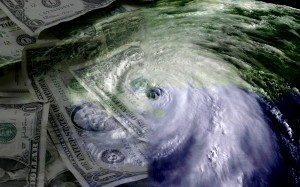 This means that in the event of hurricane damaging your home you will be required to payout the first 2% of repairs. This can be incredibly expensive and can easily add up to thousands and even tens of thousands of dollars. You may be able to negotiate lower deductibles on your insurance in exchange for higher premiums. Otherwise you will definitely want to make sure that you have extra savings on hand when Florida hurricane season comes around. Extended replacement cost coverage is another item you will want to address with your Florida hurricane insurance agent. Standard insurance coverage often falls short when you need it most. The cost of replacing, repairing or rebuilding a home often increase dramatically directly after a hurricane. This means that the amount your insurance company will pay out will fall short of what it will actually cost you, meaning that you could be left picking up the tab for the difference. Extended replacement cost coverage can be used to fill in that gap. Much of the damage resulting from hurricanes hitting Florida is actually in the form of water damage either from leaks or flooding. This is often not covered under normal hurricane and homeowners insurance. To make sure you account for this it is essential to ensure you have additional flood insurance. Even though you may have thought about and beefed up your insurance policy ahead of hurricane season, when it comes time to making hurricane insurance claims for damage to your Florida property things can be much more difficult than you expect. Insurance companies are some of the world’s largest and most profitable businesses for a reason. This is because they are experts at not having to pay out claims even though you may have paid premiums for decades. Remember that even the so called independent adjusters are actually highly influenced by the insurance companies that they essentially work for. So it is likely the only way that you are going get fully compensated for all damages in order to restore your property to the way it was is to have someone that truly represents you and is on your side. Not only is the amount of money you receive from your insurance claim important but also the amount of time it takes you to get a check. What Can Prevent You From Getting The Most For Your Florida Hurricane Insurance Claim? Where Is The Best Place To Stay Safe In A Hurricane? What Makes Hurricanes So Dangerous & Devastating?